One of the things that has quickly become a favorite thing to do is to connect people with books, with information, ideas that can change their minds and their lives. In this post I want to share with you a book, By Steve Corbett, whose title I found quite provocative. 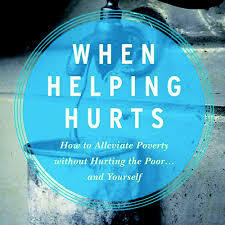 While I certainly disagree with the Author on a few points, this book is a necessity for Christians who have a heart for the poor (that should be all of us by the way). The benefits that this book provides in perspective and practical/actionable information is unmatched when thinking about ministry for/with/by the poor. You can get yourself a copy and form your own opinions to argue with me if you want. I have had the joy and pleasure of baptizing two of my three children. The following video is the special occasion that it was to baptize my daughter Madeline at Lake Cities UMC in January of 2017. It is a gift to be in covenant with a group of people who will live in loving community to help raise your child to know God.